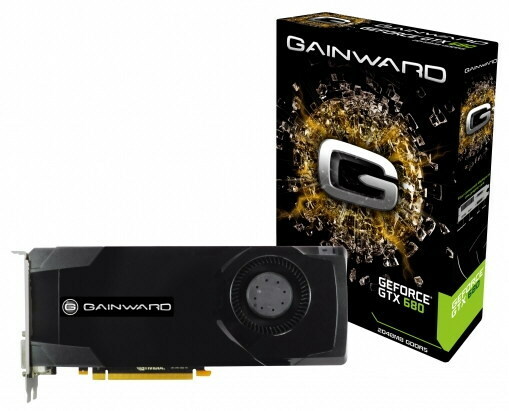 Palit-owned AIB maker Gainward has done as expected today by unveiling a branded GeForce GTX 680 graphics card. Seen below, the Kepler-powered card features support for DirectX 11(.1), CUDA, PhysX, 3D Vision Surround, and for 3-way SLI. Like all the other stock GTX 680s announced today, Gainward's offering has 1536 CUDA Cores, a base GPU clock of 1006 MHz, a 256-bit memory interface, 2 GB of GDDR5 VRAM @ 6000 MHz, a PCI-Express 3.0 bus, two 6-pin PCIe power connectors, and dual-DVI, HDMI and DisplayPort outputs. The card is now available priced at €498.95. That is like the most minimalist strip of sticker Ive seen on a GTX680 yet.